Backyard Safety - CH Edwards, Inc. Homeowners often aspire to have attractive backyards that look like they belong in a magazine. While these can be picturesque and functional for adults, they may not be entirely practical for homeowners who have young children, especially when the majority of the yard is covered with paving stones and concrete. When young children are part of a household, homeowners may benefit by designing yards that are both functional and fun. Incorporating safe play areas for kids is one way to unlock the potential of both, big and small backyards. Surface: Parents should assume children will fall. Be sure to buy equipment that is made of a material with a grip to it such as rubber. Structure: Be sure that the equipment you buy is made of a sturdy material. Cedar wood works great if you are building your own equipment. Site: Be sure to place your playset in a safe area. Avoid overhanging trees and area of the yard with direct sunlight. Safety: Follow directions for installation and don’t cut corners to save time. Make sure to anchor down all posts into the ground and check your equipment often for rusty spots and wear and tear. 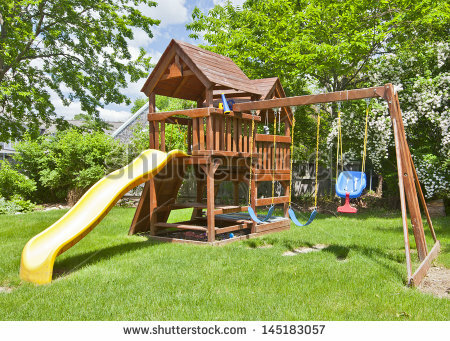 Supervision: Place your play set and play area in a place where you can easily monitor what is going on. Backyard playgrounds should be built with safety in mind. Not only for your children, but for others too.